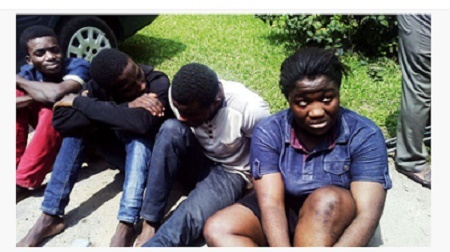 The Rivers State police command paraded this female student of Imo State University for allegedly arranging her kidnap, to extort money from her rich parents. According to The Nation, the suspect, who gave her name to the police as Chinwendu Udensi, however, had lied that her name is Miss Jennet Okoro. The girl who said she’s from Imo State was paraded with the three men that perfected the plan. While speaking, the Rivers State Police Commissioner Francis Odesanya said Miss Udensi plotted her kidnap and demanded N6 million ransom from her parents. However, she was exposed after she sent one of her accomplices to pick the ransom on Obiri Ikerre flyover at Obio/Akpor. While confessing, the suspect said she was pushed into the act because of her wealthy but stingy father’s refusal to give her money. She was also paraded with a suspected killer of a Divisional Police Officer (DPO) in Port Harcourt. The suspect, Jon Ihejekwu, a dealer in Almaco doors and windows, said his gang killed the police officer for attempting to prevent them from escaping with a stolen vehicle. The police boss said 25 suspected kidnappers have been arraigned.